Somewhere between editing video and designing full-blown motion graphics, there are countless jobs that require making things move. It may be making titles, handling transitions, moving around video and imagery in two-dimensional and three-dimensional scenes, masking, compositing, or generally arranging assets for purposes of utility or eye candy. From its first release, Apple's Motion has aimed squarely at this type of activity. It is neither unique in that regard, nor does it do more than other rival tools; instead, it promises to perform these tasks more quickly and with less effort. In its latest release, coming alongside Final Cut Pro X (FCP X), it sports a new look, expanded keying and parameter control, and a new under-the-hood architecture for greater performance. It also boasts new capabilities as a Final Cut companion. And then, there's the price. So, is Motion 5 a must-have add-on for the new Final Cut, or even as a complement to rival editors or previous versions? Motion expands on its interactive, live control of visuals by allowing you to consolidate parameters into Rigs. Assign controls, and you can use these within Motion to orchestrate various visual elements at once, or export to Final Cut, where they provide live control for yourself or a collaborating editor. 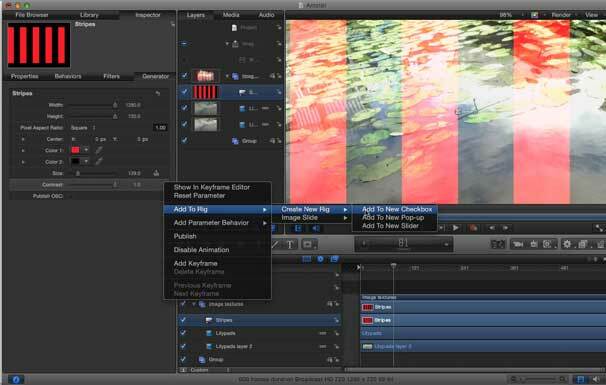 Motion, like FCP X, includes changes both visible and under-the-hood. The engine, now rewritten in Cocoa, incorporates OpenCL support for accelerating computation on compatible graphics cards, 64-bit architecture for optimized computation and access to greater memory resources, and support for Grand Central Dispatch multithreading technologies—all of which combine to help you squeeze the most out of your available hardware. As with FCP X and Compressor 4, there's also support for ColorSync color management, and a shared render engine. These changes cover the whole tool, from plug-ins to effects to rendering. More visible are other subtle but significant enhancements to functionality and control. You can now take advantage of resolution independence—ideal for targeting multiple formats. You can combine parameters into rigs to consolidate live control of your compositions, and then publish those controls to smart templates and FCP X. With Final Cut integration, it's possible to produce transitions, titles, and generators that editors can reuse in Final Cut, especially useful for producing consistent in-house templates. On the compositing side, Apple has added greatly improved chroma keying. Finally, as with FCP X, Motion 5 has also gotten a shiny interface remake. Motion's transformation, though, is far less radical; aesthetic adjustments aside, it mainly serves to consolidate settings into panes. Users of previous versions will likely find everything within a couple of minutes, and Motion has never been more usable on a lower-resolution laptop display. The ability to “publish” certain parameters when exporting filters, generators, titles, and transitions back to Final Cut Pro X gives you live manipulation of these elements in Final Cut without re-rendering, or switching to Motion. It also grants you the same capabilities Apple had when generating its Final Cut presets. The natural impulse is to compare Motion to other tools, like Adobe's After Effects ( ), that produce motion graphics and add dynamic visuals to video. However, Motion is a different kind of motion graphics program, one that emphasizes playing with parameters live and in real-time. The idea is not to choreograph elaborate, planned-out visuals and then see how they look, but to constantly experiment and tweak as the motion plays. Wrap your head around the workflow, and Motion is, above all else, quick to use. First, drop in some media—Motion supports PDF, still images, video, and Photoshop PSD with layers, though not EPS (Encapsulated PostScript). It supports PDF import, but Motion retains its own independent crop settings, so you can't simply crop a PDF externally. Next, hit the play button; you'll likely want to leave everything in Motion looping all the time so you can see immediate results. Finally, add filters, generators (covering a range of visual sources), and movement behaviors, and watch as your composition updates in real time. The new keyer chroma key filter is a real joy, far beyond what you'd expect as a bundled freebie. Drop the filter onto your footage, and compositing to a color (such as a green screen) is effective immediately. To adjust the effect, there are basic but effective and understandable controls for tuning color sampling for the background and edges, all of which nicely complement Motion's matte and 2D and 3D compositing tools. Motion is also an effective basic 3D compositor, with controls for setting layers in three-dimensional space and adding lighting and camera controls. 3D compositing is powerful, though if you need native support for stereoscopic 3D output, you'll need to look elsewhere. Also, one potential downside of the reliance on the GPU is you can get different results on different hardware; the only bugs I encountered were a couple of non-reproducible Nvidia GPU-related crashes. The heart and soul of Motion remains its extensive library of content. While it lacks the open-ended code extensibility of After Effects, in its place you can combine series of behaviors and other elements, for a visual equivalent to coding. As before, Apple also bundles a great deal of functionality and content in the box. You get sophisticated, easy-to-use match move and motion analysis and stabilization features, inherited from Apple's high-end (and now defunct) Shake product. 3D compositing includes the ability to quickly rig up a scene with depth, then add movement simply by dragging and dropping simple motion behaviors. There's a powerful, intuitive replicator and particle generator that with After Effects, for instance, would require a third-party add-on. Apple has also bundled a vast library of preset content. Advanced After Effects users will often (rightfully) praise the Expression scripting language, which allows users open-ended extensibility by enabling advanced motion behaviors in code. Motion's approach is visual rather than textual, but it should not be discounted. By combining behaviors, generators, and filters graphically—spreading them out across the timeline, and adjusting parameters on the fly—it's possible to build more complex structures. As before, any slider, anywhere—from a crop control in an image to the amount of a filter blur—can be manipulated or controlled with keyframes, audio, and even MIDI controllers. (Most audio control hardware transmits standard MIDI messages, so you could, for instance, assign the level of an effect to a knob or key on a keyboard.) What Apple has added to Motion 5 is the ability to encapsulate selected controls into dynamic parameter rigs, controlling many elements at one time. That's useful both in the context of Motion itself, and as a means of exporting smart templates and interactive visual materials to FCP X. If Motion's depth lies in lots of live parameter control, rigging combines related parameters into groups that can be controlled all at once, greatly simplifying access to that power. For instance, you might modify the display of a video in a 3D composition, adjusting the position of the camera rotating around it, changing its position in space, and altering a color balance filter on the video. With the rig, you could combine those elements and control them together, which could, for instance, greatly simplify adjusting the timing of all those elements against another video or a sound bed. It's useful enough that you really don't need FCP X to make this feature alone worth the upgrade. To create a rig, you first select the parameters you wish to control, then assign them, one by one, to a master rig that will control all of them. The rig is composed of widgets—either a pop-up, checkbox, or slider—which provide both an interface for exported templates published to Final Cut and a means of controlling parameters within Motion itself. You can even nest widgets within other widgets. As with other Motion parameters, you can assign MIDI and audio control or behaviors like Wriggle and Random. The result is a kind of generative, modular system for producing dynamic motion effects without coding. As with any graphical system, sometimes this makes tasks harder or less direct than with code, and sometimes it makes things a great deal more understandable. If you have experience with something like After Effects Expressions, however, you may find some of these differences refreshing and complementary, and that your background in Expression code translates well to understanding how to make the most of this feature. Motion's plug-in architecture isn't yet as broad as After Effect's ecosystem, but this appears set to change, especially with Motion's aggressive pricing and expanded FxPlug2 SDK. 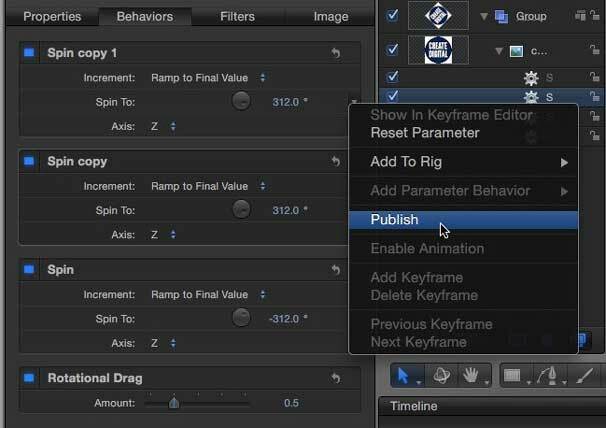 Noise Industries, Genarts, and Ripple Training have shipped Motion 5 plug-ins already, and other vendors are committed to shipping updated plug-ins. Motion's new keyer, for chroma key compositing, is easy to understand and use; you'll often get decent results on the first try, and controls for fine-tuning are straightforward and effective. Motion makes a natural companion to FCP X, either for editors who need to quickly generate assets for Final Cut, or dedicated motion graphics designers wishing to collaborate with editors using Final Cut. Motion is capable of exporting four kinds of files back to the latest release of Final Cut: Transitions make use of Motion's various eye candy tools for slick edits between materials; generators produce graphics dynamically (such as particle effects); titles allow use of animated text with typographical controls and RTF file import; and filters allow combinations of image- and video-processing effects. A natural workflow, then, would be to jump into Motion to create some quick titles, export back to FCP X, and then make adjustments as needed from within the Final Cut timeline. This is where the use of rigs can really shine: Motion supports the creation of dynamic, intelligent templates. 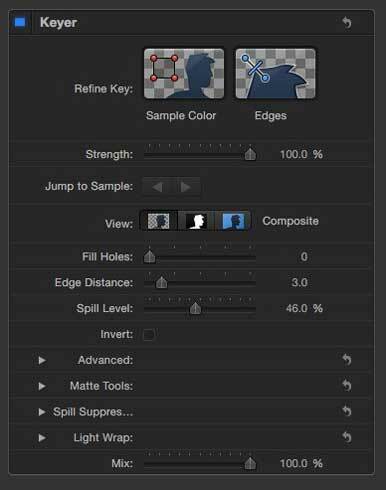 You can choose not only which parameters to make visible in Final Cut, but even how you wish to define ranges, drop zones for adding standard assets, and locked-down parameters. For an individual user, this means you can start your work in Motion, then adjust it in real-time in Final Cut to finish the job, without ever re-rendering or switching apps. For organizations with multiple users of FCP X, it has even greater utility, since it means that even novice editors can define easy-to-use house templates with strict parameters for everything from video effects to titles. On the Final Cut side, your content appears in exactly the way that the presets Apple ships do; in fact, those presets are likewise created entirely in Motion. In the absence of specific integration features, in order to process a video clip from Final Cut Pro in Motion, you would choose Reveal in Finder, operate directly on the video clip, export the results, and re-import and replace the clip. In other words, you do manually what automatic round-trip workflows previously did. The upshot is that for those not interested in the slick, new template features, it really doesn't matter whether you're using FCP X or another another editor. This workflow does the job, too—and given some of the complexities of fancier integration, might even be preferable to some users. But it means there's some room for improvement, particularly for editors who want to switch frequently between the two tools for genuine, bi-directional integration. The workaround to preserving audio is to export a self-contained Movie, and re-import as an event in Final Cut Pro. The integration of rigs and templates will likely make the FCP X combination with Motion very useful in certain situations, such as organizations wanting to establish a consistent visual identity, or individuals who want dynamic control over Motion creations as they work in Final Cut. But given the shared mechanisms for media asset management and rendering, the level of integration leaves room for improvement. Motion 5 (available for download only on the Mac App Store) still lacks some features that might open it to consideration as your primary graphics workstation: tools like native EPS import (which Adobe CS5 supports), advanced typographical controls, and open-ended scripting. But that's not really the point. As a means of building titles, filters, transitions, and generators for FCP X, Motion is well-suited to the job, and the only way to build interactive assets for that program. Even before considering its new impulse-buy pricing, it's also a worthy investment for anyone looking to add a little extra visual power to their creative arsenal. Keying is dead-simple, and rigs expand upon Motion's already rich, quick visual-generating powers. It'd be nice to see still-deeper bi-directional integration with FCP X as it matures, and to build out some of the breadth of Motion itself. But at this price, and with this speed and flexibility, you'll be hard-pressed to find an argument not to find a space for it on your Dock—even if you choose to pass on FCP X.